Cloud recently picked up the IBF title against Clinton Woods last time out but now is in a similar position to Mack and wondering who he will fight next. Because of the way the IBF is governed the number 1 and number 2 spots are places you have to pay sanctioning fees in order to be considered for, in the Light Heavyweight division both of these slots are currently vacant. So what happens next does Cloud have to wait until a promoter is willing to pay sanctioning fees in order to have two guys face off for the number one spot? Mack has already been in negotiations with fighters to fight for this spot but for the following reasons these have fallen through. If Tarver wants to continue with his career you would think he needs to win a decent fight to get back up there, unfortunatly he seems to be waiting for someone to offer him a mega money fight, I would be very surprised if this happens as he is not one of the most exciting fighters to watch and he has lost 3 out of his last 6 fights. He seems content commentating on Showtime and I think we might have seen the last of the Magic Man, if this is the case why is he still in the rankings? Both promotional teams are playing games offering joke like purse offers for these two guys to get it on, Murat will not be a big draw in the States as he is pretty much unknown and probably Mack will not be a huge draw over in Germany. So there seems little interest in actually getting this fight on, Murat is also rated highly in the WBO and with his team seemingly pulling the strings in the WBO he is likely to fight Juergen Braehmer for the title after Braehmer wins his joke title shot against the inexperienced and limited Dmitry Sukhotsky who career best win is over Juan Nelongo (21-8) who had lost 2 of his last 3 fights one to a fighter 5-0. I doubt these two will ever meet in the ring, Murat is limited and will lose before being given the chance to fight on the world scene. Uzelkov was robbed out of his opportunity to fight champion Campillo when some careful business work and well placed accusations confirmed Bebuit Shumenov of a rematch. Being placed in the number one position would make any fight with Mack or any fight with any potential risk unlikely. He is likely to keep himself busy with limited opponents until he is given his opportunity for the title it should be against the winner of Shumenov and Campillo. There are a number of financial reasons why this fight will not happen, Garay only won the WBA title as Danny Green vacated, he is not a big drawn and lost in his defence against a super middleweight drafted in as an easy defence, who had lost 2 out of his last 3 fights (Campillo) Nobody in the states would be interested in seeing this fight as a main event and Garay's protonial team are not wealthy. I am surprised Garay is still ranked so highly but he is need of a big fight so if some arrangement can be made finacially maybe this fight will happen but I doubt it, Garay is likely to get another title shot or will be used as an opponent in Germany. Bell has faced limited opposition in his carrer and has already lost 5 from 23 fights and has a draw, he has won his last 6 fights and picked up minor titles which has boosted him into the rankings. Mack would jump at the chance to take on Bell, but I think he would have to go to Australia to do so, Bell has never fought out of his native country and probably will not have been heard of by many outside there, so there would be little interest in TV purchasing that fight over here. Maybe there would be a chance of him fighting Mack on a co-main with a big fight over there, but unlikely as they are probably looking to continue building Bell at a lower level. A rematch between these two is likely to happen at some point, Mack won the first fight clearly despite the judges decision calling it as a split decision. Henry has called out Mack a couple of times, but when actually offered the fight, his team turned it down. Henry bounced back from the defeat with a solid stoppage of Shaun George and is back up in the rankings. I doubt Henry's people will risk a fight with Mack unless there is a decent amount of money on the table or a title, and at the moment that will not happen. There has been mentioned of this fight taking place but again Kostecki is just not known in the states and there will not be the money here to make it, also Kostecki is from Poland and again there is not the money to take Mack over there to fight. Kostecki will need to take a risk and fight outside his home town in order to make himself a bigger name and a good opponent for a top level fighter, at the moment it doesn't look like happening. Kuziemsky lost in his first real step up in class against Juergen Braehmer last time out when being stopped in the 11th round, I would imagine that his people will be looking to rebuild him back up with a couple of wins before stepping him up in class again. Throwing him in with Mack would not be the smartest management move. Also he would be of interest to the US public so TV would be out, uless he was prepared to come over to the States for a limited amount of money this fight is not likely to happen in the near future. 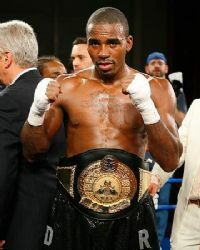 Dawson has established himself as the best in the division, unfortunatly he now feels above the titles, he rubbished the WBC when throwing the belt away to avoid fighting mandatory challenger Adrian Diaconu, he then rubbished the IBF rather than fight the mandatory challenger Tavoris Cloud, now for some reason the WBC offered him the opportunity to fight for their interim belt despite him probably having little interest in fighting the winner of Pascal v Diaconu, he is looking for the money fights, he wants Bernard Hopkins or one of the real big names of the sport, maybe we will see him fighting Lucian Bute at a catch weight, if the WBC champion is not big enough for Dawson then Mack certainly will not be. There was an opportunity of this fight taking place recently when Hopkins took the easier option fighting Enrique Ornelas, Mack v Hopkins in Phillidelpia would have been a great draw, however Hopkins was planning on a huge money fight with Roy Jones Jr. Jones Jr lost to Danny Green and now Hopkins plans have to change, he has talked about moving to heavyweight to fight David Haye, or maybe a bout with Chad Dawson, or a cruiserweight champion. Hopkins has only a couple of fights left in the tank so he now needs to select them to earn as much money as possible. Mack will not feature in these plans. Both of these guys are with the same promoter, Johnson needs a way back to the top and Mack wants to get there, Dibella have a huge show in January with Shane Mosley and Andre Berto so Mack v Johnson would make an ideal co main event. The styles make a very exciting bout with Johnson a come forward ruggered fighter and Mack is a counter puncher who is not afraid to stand and trade. To me this fight makes a lot of sence and the winner should be in line for a title shot or a big money fight, the pair met when Glen Johnson was ringside for Macks win over DeAndrey Abron, Johnson then stated that him and Mack would meet soon, so lets get it on. The boxing world will want to see this fight so there should be any problem getting it funded and with Dibella promoting both these guys then he will also win. 43 year old Branco pulled off a decent performance against Pascal in his world title shot but was stopped in the 10th round, prior to that he was gifted with a number of easy wins to get him in position to fight for the title. Where does he go from here, at his age and the fact that he is not a big draw anywhere apart from his native Italy. I think he will be lucky to get another chance on the world scene, maybe a European title fight might be his last fight if he has not already had it. The likelyhood of fighting Yusaf Mack in the US or Yusaf Mack fighting Branco in Italy is very very unlikely. African champion Chilembe just picked up the WBC International title in his best win last time out, he is only 14-1 but is being moved along quickly having already complete the full 12 round distance 3 times. The problem here is not only Chilembe relitively unknown, it also is very expensive to bring African fighters to the USA, there is a small possiblility that Mack would go over to South Africa to fight as occassionally they do bring fighters over from the US, but it is unlikely. Francis is reaching the end of his career, he would probably jump at the chance to fight Mack for not a huge amount of money, the problem again comes is that Francis was knockout out by a journeyman recently and it is very doubtful that anyone would buy this fight. Mack would jump at this fight is anyone would be willing to put it on.